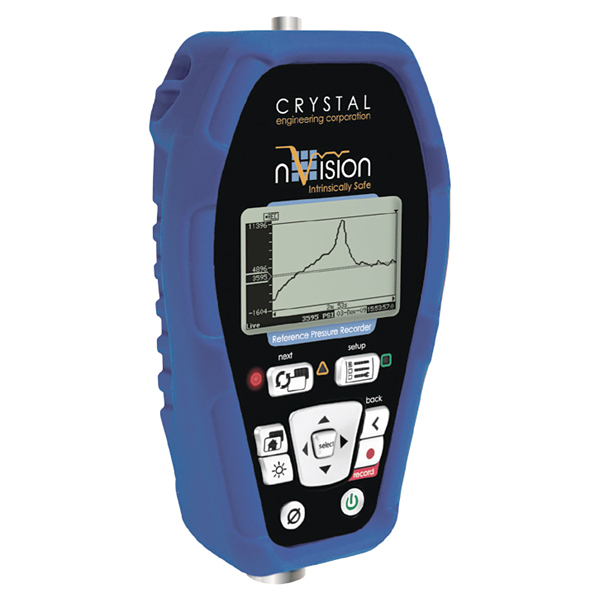 Crystal N-Vision Base Unit ~ New Intrinsically Safe Reference Pressure Recorder! It's not just a new pressure calibrator or a new pressure recorder. It's a field calibrator that can display recorded data graphically on a high resolution screen. No need to stop a test to analyze data on a PC. Stored data, or data being recorded can be displayed graphically, with the ability to zoom into specific events, or zoom out to get a big picture of your test. There's never been anything like this! Temperature: Operating & Compensated: -20C to 50C (-4F to 122F); Storage:-40C to 75C (-40F to 167F) No change in accuracy over operating range. Connections: Crystal CPF System: Medium Pressure Female (1/4" medium pressure tube system with 7/16-20 threads). Fitting interfaces with the Crystal Pressure Fittings System; finger tight to 10,000 PSI from -20C to 50C with a 4:1 safety factor. System can interface wrench-tight with non-CPF medium pressure fitting, adapter, and piping system: HIP LM4 & LF4 Series, Autoclave M4M4, SF250CS & SF250CX Series. Compatible with Vista (SP 2), Windows 7 (SP 1), Windows 8.1 and Windows 10.